One of my main goals in creating the Sibley Guide to Trees was to apply modern methods of bird study to tree identification. This meant looking at trees at a distance and trying to figure out what, if any, differences would allow me to distinguish species quickly and reliably in just a glance. I continue to learn more about this all the time, and a few days ago in New Hampshire I photographed these three trees. Three common conifers in New Hampshire, in three different genera, can all be distinguished by branching patterns and overall shape and structure. Photo 24 Feb 2011, copyright David Sibley. The rightmost tree of these three is the most distinctive, with very slender and delicate branches all drooping at the tips. This is an Eastern Hemlock. The other two are more similar to each other, but close examination with an eye to the overall structure reveals that the tree on the far left is more compact, with shorter branches, straighter and more rigidly held, with less air showing through, and with a very narrow spire-like crown. This is a Balsam Fir, and the stiff and compact form is typical of most firs (Genus Abies). The middle tree is a Red Spruce, with the more “relaxed” and open form typical of most spruces (Genus Picea). Just as in bird identification, it can take a bit of practice to “tune” your perception so that these differences are more obvious to you, but with practice you can be identifying trees (at least to genus) at a glance. Yes, tree identification in this way requires quite a bit of practice just to train your “eye” so that you can see the differences. I think it’s a question of learning which details of shape and branching patterns are important and which are not, so you can look past all of the “noise” of individual variation and see the “signal” that is distinctive for each genus or species. Just as in bird identification, it helps when someone points out the key features, but in order to use that effectively you have to practice on a lot of trees. There is no substitute for experience. Ah, yes, the “gestalt” system. 🙂 As I child in OR, I quickly named hemlocks (western) Floppy Tops. 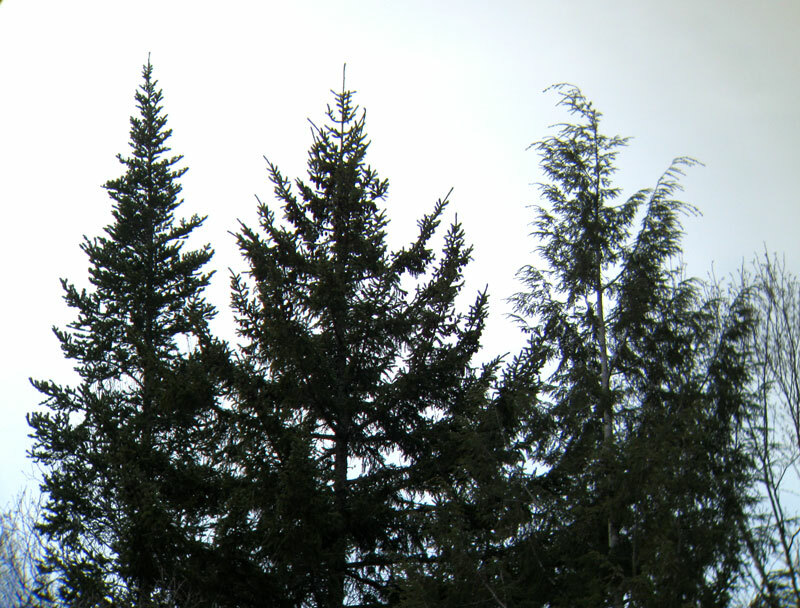 Westerners’ most common “fir” looks more like your middle tree, though; and worse, it’s translatable as a ‘false-hemlock’…Pseudotsuga, of course! One of the few instances where scientific names are nearly as annoying as common ones! (Used to be even better before they decided “menziesii” had precedence over the previous species name, taxifolia–or “yew-leafed!” The yew-leafed false hemlock called Douglas Fir. (Which according to your gestalt pic looks spruce-like.) Gotta love it! Ah yes, the Douglas-Fir (which is not a fir) does have a loose and “soft” look, even more so than most spruces. They are really variable though. Nice picture. I like gestalt. However, I have purchased some (10-15) saplings that I think are Eastern Hemlock and lots of spruce of all ages on land in central Ontario south of the shield. From what I have read it is the pattern of needles on their stems that will distinguish them. This is hard to communicate in a 2D image. My dad was a logger.I was directed to your site by an article you had on fir/spruce/hemlock.Having grown up in the Adirondacks and my dads love of the forest I learned to value all “things” of the woods.On a philosophical note to me the trees and birds are one…..God speaking.